The upcoming 2019 free agent class in the NBA is absolutely loaded with superstar talent. Kevin Durant, Kyrie Irving, Kawhi Leonard, Tobias Harris, and Klay Thompson are among the great players set to hit the open market in what is sure to be one of the most exciting NBA offseasons in recent history. Beyond those players, there is still plenty of value to be had. In fact, teams that miss out on big names should still be able to improve their roster with tons of quality players remaining. Here are five of the most interesting non-elite free agents in 2019. In two years, Thomas has gone from legit MVP candidate to registering DNPs on the Nuggets bench. Even with his value slipping, the undersized point guard represents an intriguing gamble for a team looking for instant offense. Thomas hasn’t looked 100 percent this season and has failed to make an impact so far for Denver. He has played in just 10 games thanks to hip surgery, which sidelined him until mid-February. But even a slowed down version of Thomas is worth it for the right price. When healthy, he has shown the ability to stretch the floor and be incredibly crafty in the paint. The more responsibility he gets, the more he thrives. Thomas has made being smaller work to his advantage. It is fair to call this season a write off for Thomas. If he can enter training camp healthy and return to even half the player he was previously, he will be an excellent buy-low candidate. He is an early Comeback Player of the Year candidate for 2019-20. 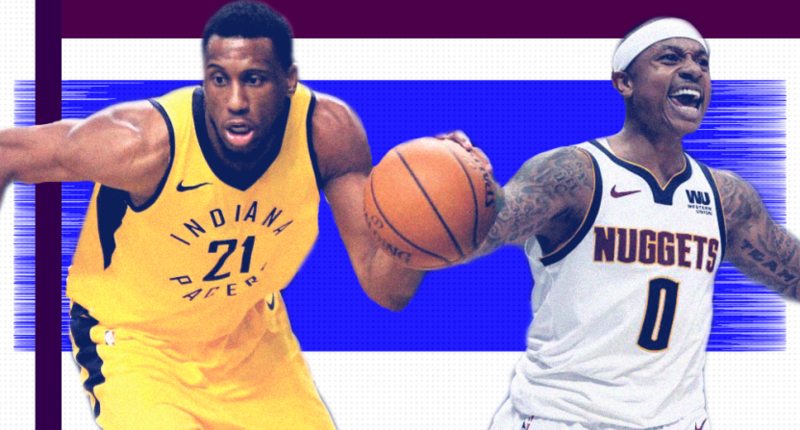 Thaddeus Young might not be the sexiest name to hit free agency, but the Pacers power forward is one of those glue guys every playoff team could use. In his third season with Indiana, Young has remained a consistent contributor who does a lot of good things on the floor. He is an excellent defender, especially on the perimeter, and can guard multiple positions. Offensively, Young thrives on the offensive glass and can score in a variety of ways. While I wouldn’t call any single skill he has outstanding, he does so many things right that he is a high impact third or fourth option. Young is averaging 12.5 points, 6.5 rebounds, and 4.1 assists per game over 71 games this season. The Pacers are flush with cash going forward and if they want to keep their current competitive window going, re-signing Young should be priority number one this offseason. Including Young, Indiana has four of their five highest-paid players hitting free agency this summer. Bojan Bogdanovic is another guy they would presumably like to keep, though he should draw considerable interest around the league. In his second year with the Pacers, Bogdanovic is in the midst of a career-best season. In 71 games, the sharpshooter is averaging a career-high 17.8 points, 4.1 rebounds, 1.9 assists, and 0.9 steals per game, while shooting 41.8% from three. Bogdanovic has proven to be more than just a three-point shooter and he has welcomed the challenge of being the team’s top scorer in Victor Oladipo’s absence, as he’s averaged 22.2 points per game since the All-Star break. He might not keep up that production, but at the very least, he has shown he is capable of being a top scoring option. Great three-point shooters are deeply coveted, and Bogdanovic has set himself up nicely to get paid in free agency. It would be a complete shock if Middleton opted into his $13 million player option for next season, as the shooting guard will almost certainly hit free agency in hopes of landing a long term deal. He will be in high demand. At 27, Middleton might be the league’s most underrated player. With the Bucks, he has continued to build on his breakout 2017-18 season, averaging 17.6 points per game, while shooting 37% from three and 43 percent from the field. As a 6’8″ two guard, Middleton is an above average defender with versatility. In short, he does so many things right on the court thanks to a high basketball IQ. There has been chatter that Middleton has lined himself for a max contract, which isn’t as an outrageous of a thought as it might seem. He’s a quality player with a perfect skill set for the modern NBA. It is why he was an All-Star this year. Middleton might never be a number one option, but as he has proven in Milwaukee paired alongside Giannis Antetokounmpo, he makes for a great number two. The Magic might lack an identity as a team, but Vucevic has come into his own as an All-Star at the right time. The 7’0″ center is enjoying the best year of his career in his eighth season in the NBA. As a big, he’s a great passer and one of the best rebounders in the NBA. Vucevic is averaging a career-high 20.7 points, 12.1 rebounds, and 3.9 assists per game. Most surprisingly, the Orlando big man is shooting 37.4 percent from the three. His three-point shooting has added a new dimension to his game this season. Vucevic has played tremendous basketball in a bizarre lineup for the Magic. Orlando doesn’t have a single average point guard on their roster and they often run three bigs in Vucevic, Jonathan Isaac, and Aaron Gordon. With a capable point guard and more shooters around him, he has the chance to become even better. The Magic should do everything in their power to re-sign Vucevic.